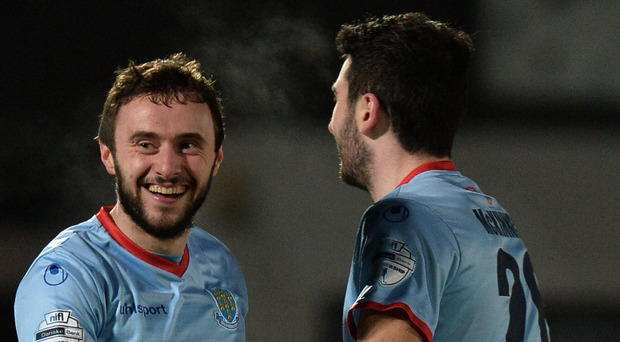 Ballymena United reached their third Toals County Antrim Shield final in six years with a comfortable semi-final win over Ards at the Showgrounds. Ballymena could have gone ahead inside the opening 60 seconds as Cathair Friel released Johnny McMurray down the left flank but, as the striker bore down on goal, keeper Sam Johnston was quickly off his line to block the effort. The reprieve, however, was short-lived for the visitors as Ballymena went in front on five minutes when left-back Steven McCullough curled home a free kick from the corner of the penalty area after Joe McKinney had been fouled by Gareth Tommons. Ards almost found a way back into the match when Johnny Taylor's header from a corner was cleared off the line by a combination of Fra McCaffrey and keeper Ross Glendinning. Instead it was Ballymena who doubled their advantage on 13 minutes after a lightning quick counter-attack from McMurray, which also saw contributions from Fra McCaffrey and Cathair Friel, which culminated with Conor McCloskey sliding home at the back post. Ards tried desperately to get a foothold in the game and they came close when David McAllister's shot from the edge of the penalty area beat Ross Glendinning but could only find the side netting. Ballymena were the width of the woodwork away from making it 3-0 on 35 minutes when McCloskey's free kick was superbly pushed onto the crossbar by Johnston. The young goalkeeper excelled once again a minute before the interval when he dived to his left to push away Tony Kane's penalty kick, harshly awarded by referee Evan Boyce after a 50/50 challenge in the penalty area between Johnny McMurray and Ards defender Johnny Taylor. Ballymena looked for a quick finish to the tie at the start of the second half with Friel's shot in a crowded penalty area blocked by Johnston and McMurray's follow-up effort hacked off the line by Reece Glendinning. At the other end, Michael McLellan carved out an opening for Ards with a clever turn and shot but Ross Glendinning was able to stretch to turn the effort behind. McMurray was again involved in setting up a United chance when he surged past Michael Ruddy into the penalty area, but his teasing cross was headed over by Friel under pressure from Reece Glendinning. Livewire McMurray almost added a third goal for Ballymena when his long range drive dipped over Johnston but crashed back off the crossbar. But United wrapped up their place in the final with three minutes left when Friel cut inside from the left and rolled a shot into the corner of the net. BALLYMENA UNITED: Glendinning, Ervin, Friars (Owens, 30 mins), Balmer, McCullough, Kane, McCaffrey, McKinney, McCloskey (Faulkner, 75 mins), Friel, McMurray (Shevlin, 87 mins). Subs not used: Brennan, Gault. Ards: Johnston, Glendinning, Taylor, Byers, Ruddy, Frazer (McMillan, 15 mins), Hanley (Cherry, 65 mins), Tommons, McAllister, McLellan, Mitchell (McComb, 75 mins). Subs not used: Kelly, Hall.